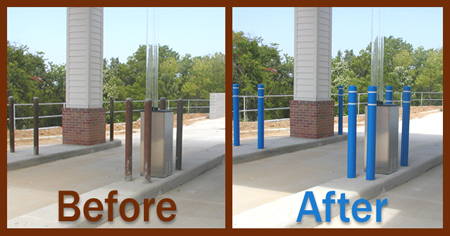 Steel Pipe Bollards are u sed to protect facilities, parking and pedestrian areas. They keep vehicles from invading storefronts, bank drive-thru ATMs and many structural utility areas. 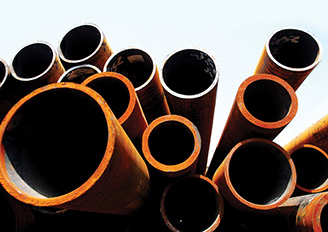 Steel Pipe Bollards are permanently fixed at the point of installation with a portion of the pipe secured below ground. By adding a Post Guard Bollard Cover to the steel pipe bollard, you eliminate the need for continual painting of the bollard post. The many attractive colors of the Post Guard can dramatically change not only the look of a steel pipe bollard but your facility as well. Visit our Steel Pipe Bollard page for more information. This entry was posted in Facility and Parking Lot Safety, Facility Maintenance and tagged bollard covers, facilities maintenance, facility protection, parking lot safety, Post Guard bollard covers, protective pipe bollards, steel pipe bollards. Bookmark the permalink.